The last nine years of Epstein’s life were a period of public works and portraits of the famous. He began to receive a large volume of commissions, and sculpted a number of eminent men.In 1950 he was commissioned to sculpt a 13 feet tall statue of the Madonna and Child for the Covent of the Holy Child Jesus in Cavendish Square. The following year the life size bronze Youth Advancing was displayed at the Festival of Britain and Lazarus was exhibited at Battersea Park. He also modelled portraits of T.S. Eliot and W. Somerset Maugham, and travelled to Philadelphia. The trip to Philadelphia was to discuss a commission. This commission, called Social Consciousness, was the only large scale project that Epstein ever carried out in his native country. Epstein produced five huge bronze figures which were to form part of the Ellen Phillips Samuel Memorial. The Memorial was a series of symbolic bronzes and carvings designed to represent the history of America. In spite of the intended sale of the project, Epstein’s figures were too expansive to complement the other sculptures in the project and they were eventually moved to a terrace outside the Philadelphia Museum of Art. In 1952 the Arts Council organised a retrospective of Epstein’s work, which was held at the Tate. 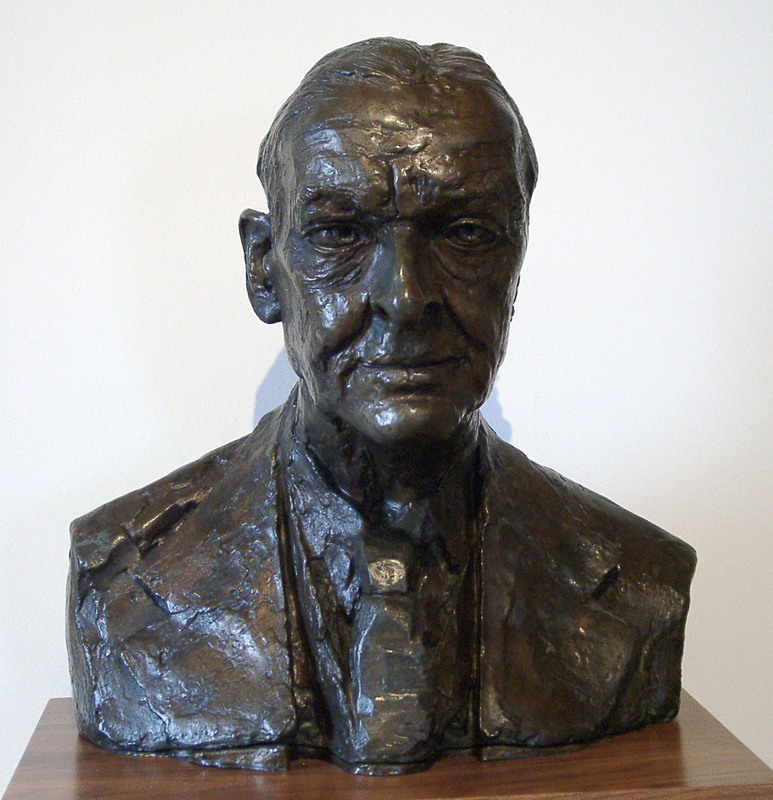 The following year Epstein refused an offer of membership to the Royal Society of Sculptors. The Society had not backed him when he needed support during the British Medical Association building controversy in 1908, and had refused him membership shortly afterwards. However, Epstein did accept an honorary doctorate from Oxford. Epstein received two further commissions in 1953; Christ in Majesty for Llandaff Cathedral and Field Marshall Smuts for Parliament Square. This was also the year in which the Cavendish Square Madonna and Child was unveiled, and Epstein modelled Bertrand Russell. At some point in 1954 Epstein received a letter in a brown envelope which he nearly didn’t open because he thought it was a tax bill. The letter was in fact an offer of a knighthood, which Epstein received from the Queen Mother. He also began work on Liverpool Resurgent for the John Lewis department store in Liverpool. Theodore and Esther Garman, two of his three children with Kathleen Garman, died in 1954. Theo died during an attempt to hospitalise him for treatment for recurrent mental illness, and Esther was so distraught at the the death of her brother that she committed suicide shortly afterwards. Epstein and Kathleen Garman were married at a private ceremony in 1955 and travelled to Philadelphia for the unveiling of Social Consciousness. Epstein was then commissioned to create the Trades Union Congress War Memorial in London and St Michael and the Devil for Coventry Cathedral. In 1956 Liverpool Resurgent and Field Marshall Smuts were unveiled and Epstein received another commission, for a memorial to William Blake in Westminster Abbey. Christ in Majesty and William Blake were unveiled in 1957. Epstein was too ill to attend the unveiling of the TUC War Memorial in 1958, but recovered sufficiently to model Princess Margaret later that year, and begin work on his last commission, the Bowater House Group. Epstein completed two pieces of work in his final year. He modelled a posthumous portrait of David Lloyd George for the House of Parliament and finished the Bowater House Group on the day of his death. He died on 19th August 1959 at home at Hyde Park Gate. The memorial service was held at St Paul’s Cathedral and he was buried in Putney Vale Cemetery.